Today was a nice cool day for a magic show in the park. Around 250 people attended the comedy magic show in Wisconsin. The Osceola, WI town celebration draws families from around the area. There was face painting, fish painting and of course loads of rhubarb treats! I love to bring comedy magic to the families. The kid’s faces light up with joy as the fun tricks unfold. They were such a great audience and the laughter was infectious. This was the fifth or sixth time this festival has brought my magic to entertain the families in WIsconsin. It is a wonderful event and I am thankful they invite me back again and again. Where did it go??? It must be magic! Magic brings a smile to all ages. Many of the tricks I do are original inventions and the kids love to see the unique comedy tricks. 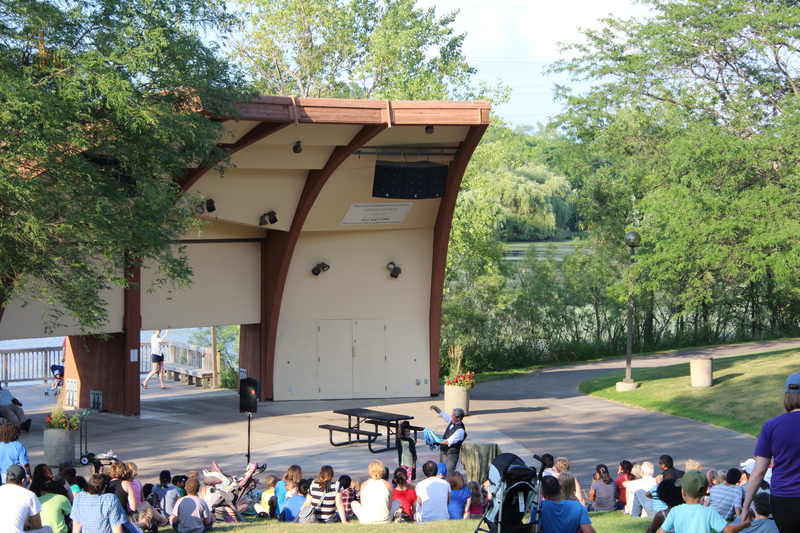 I love to be a magician in the Twin Cities and present comedy that is enjoyed by all ages.. If you need Family entertainment in Minneapolis or the surrounding area please check our website…. Magician-Minneapolis.com. When you need lots of fun for your family party consider Mr. Norm the Comedy Magician in the Twin Cities. others were checked out from this MN author. Magician in the Twin Cities, MN. Rogers Library Children’s Librarian Abike and Mr. Norm with a few of his books that can be found at the library. It was fun to bring the comedy and magic show to the families in Roger’s, MN. This Hennepin County Library has had the magic show by Mr. Norm at least 6 times over the past 20 years. I enjoy hearing the laughter. It is exciting to get kids motivated to read. “Norm did a wonderful job presenting at our library. His program was informative, interactive, engaging and entertaining. Our patrons really enjoyed his show and gave us positive comments. We can’t wait to have you back for another visit. My goal is to promote reading and get kids excited about going to the library. 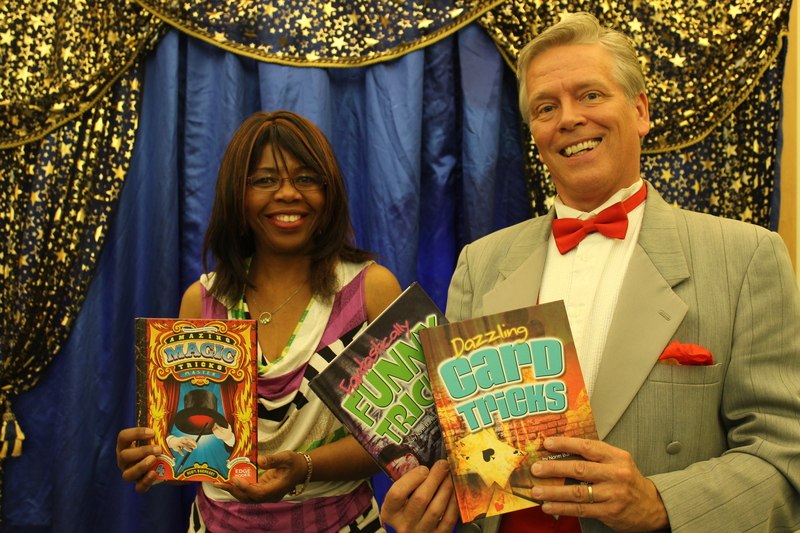 This has been my purpose for nearly 30 years as I have crossed the country bringing the motivational magic show to students in schools and families at libraries. I have presented programs and thousands of schools in all 50 states. It is fun to see my best selling books at the libraries too. Have fun reading this summer. It was fun to be a part of the Family Night at the Central Park in Roseville, MN. this fun event is sponsored by the Roseville Police Department and this was my fourth year of making some magic for the large crowd. “Magic Norm was an excellent addition to our Family Night Out. We invited Magic Norm to do strolling Magic, a Magic Show, and he even wrapped up the evening with balloon animals for the kids. Magic Norm is professional and a true entertainer. We look forward to having him back each year.”- Corey Y. – Roseville Police Department.